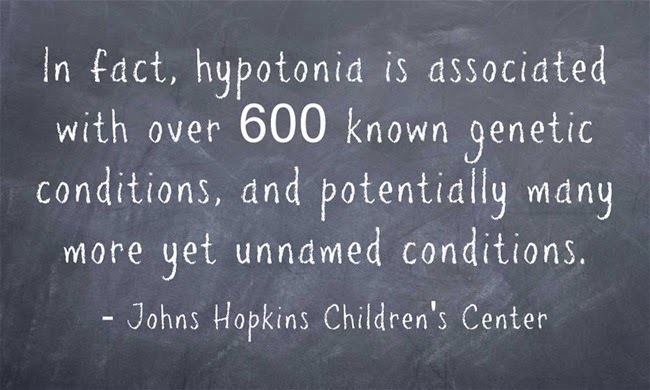 I have been sharing our hypotonia journey with the hopes of raising awareness. And while I will continue to write about and share our story, our struggles, and our successes, for the month of December, I will be focusing on the facts. December is Ceci's birth month, so for each day leading up to her birthday, December 16th, I will be sharing a hypotonia fact on my blog and via my Facebook. Feel free to join me on this journey of hope...my journey to raise hypotonia awareness. Share the facts with the important people in your world! There is nothing I would love more than to see 16 days of Facebook, Twitter, etc. filled with the facts.